How does Sara demonstrate the spirit of the “Help Somebody Hall of Fame”? Sara is a bundle of energy – and she is constantly finding ways to use that energy to help others. 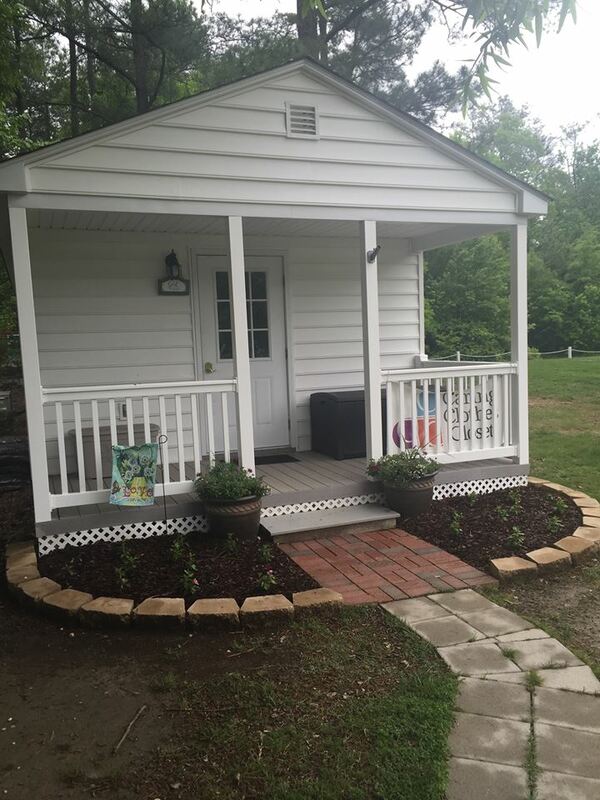 Her most recent project was through Shady Grove United Methodist Church. She realized that in the surrounding community, there were a lot of people who had clothes that were gently used while at the same time, there were many people who don’t have even the basics. She approached the pastor with the idea of creating a place where gently used clothes could be donated, and in turn provided to those so desperately in need. There were many hurdles to jump to make this happen – including but not limited to, where this would be, how it would all work, and who would run it. 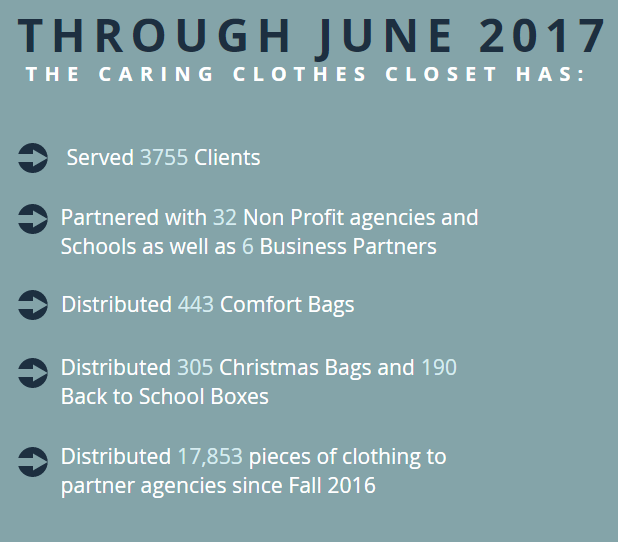 In less than 2 years, not only is the Caring Clothes Closet up and running, it’s thriving. We have a dedicated building, clothes constantly coming and going, and volunteers who truly love being a resource. CCC partners with many organizations, like UMFS and CARITAS to help serve the needs of the community more effectively. In addition, people within our own immediate suburban area are also helped in times of crisis such as fires, displacement, job loss, etc. To date, clothing has been provided for families who are victims of domestic violence, malnourished children, sibling groups pulled from their homes weeks before Christmas, and the homeless. And, in 2017, Caring Clothes Closet became an official nonprofit! This was all from Sara’s vision and desire to help. The Caring Clothes Closet, located at Shady Grove United Methodist Church in Glen Allen. What is the impact of Sara’s generosity? Simply put, people from across Richmond have access to clothes. There is steady traffic, whether members of the community dropping off clothes, volunteers organizing what has been donated, or shoppers browsing through the tightly packed racks, it’s rarely empty. Sara has an innate ability to love others and make them feel important, so it’s not uncommon to see her in the clothes closet helping someone create an outfit and making them feel like a million bucks. The smiles on the faces of the people who have received clothes are unlike any other. It can be a humbling experience to admit you have such a basic need and sometimes, people are a bit uncomfortable when they arrive on their first visit. What’s remarkable is that they are instantly put at ease, made to feel welcome, and treated with such dignity. Therefore, the real and the most lasting impact is that people leave the Caring Clothes Closet with a smile and the sense that they matter. This offers something to people that goes far beyond the items they take with them. In addition to clothing that they need, they leave with confidence, restored self-respect, hope, and huge smiles. None of those things can be bought, and their value simply cannot be matched. Is there anything else you want to share about Sara? I truly believe that Sara deserves this recognition. If you asked her, she would tell you that she’s simply grateful to help people, and while that is true, I would like to see her tireless efforts commended. The Caring Clothes Closet is one of many initiatives that Sara has started that have been successful beyond what even she could imagine. What I find most inspiring about Sara is that everything she does, she does with love. In no way would she want to be recognized, nor would she ever admit to the effort she herself has put in. She would tell you that she had a lot of help and that she’s just meeting the needs of others around her. That is the mark of a true leader; one who sees a need, acts on it, and takes far less credit than is deserved.